Dissolve hot cocoa, chocolate syrup and Splenda in hot water. Add light soy milk, vodka and Torani syrup. Pour into blender. Blend with ice on the highest speed for about 45 seconds. Pour, and top with a squirt of Fat Free Reddi-Wip! Pour over ice and enjoy this tropical treat! Shake with ice. 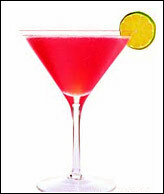 Pour into cute martini glass. Drink up! June 16th is National Fudge Day. Perhaps you need to celebrate with one of HG's Chilly Chocolate Mudslides instead?! Share these ROCKIN' cocktail recipes with everyone you know. Click "send to a friend" NOW! **Not old enough to sip cocktails? Don't like the taste of alcohol? These recipes can all be made without using any alcohol at all. They'll taste great and contain way fewer calories!